This page is dedicated to where to meet, what flights to book, what to bring, and details about transportation and money on the Frontier Explorer. Morioka is a major train station located on a bullet train line which has direct access to Tokyo Station as well as direct access from Shin-Hakodate-Hokuto Station in Hokkaido. ​Morioka Station can be reached with a 2.5 hour high-speed train ride from Tokyo, reaching speeds of 360km/h in the process! Pro tip: Even with just one Tokyo/Morioka round trip, you'll save ¥13,000 (approx US$110) by buying a JR East Rail Pass for the Tohoku area. You can buy this train pass on arrival at NRT or HND airports, as well as major hubs like Tokyo Station. This pass gives you 5 unlimited days of riding anywhere on the JR East Rail Network, which is perfect for where the Frontier Explorer operates. As a bonus, you'll still have 3 unlimited days left at the end of the tour to use as you want! You can see full details on the pass here. Option #2 is to meet the tour at our hotel at 7:30pm, which is the Daiwa Roynet Morioka Hotel. If you're planning on staying in Tokyo before the trip, you can mail your big clunky ski bag directly to the Daiwa Roynet hotel in Morioka for only ¥2,000 (approx US$18). If you're spending an extra day or two in Japan after the trip, you can mail your ski bag directly to NRT or HND airports. It only takes 48 hours from the time to mail your bag until the time it's delivered. Arrive into Tokyo two days before the trip at 6pm and mail your bag to the Daiwa Roynet hotel in Morioka from the airport. Your baggage should arrive at the hotel before 9pm the next day. Before mailing your bag, be sure to confirm with them that it will be delivered by the night of the tour start date. In Japan, if they promise a delivery time, it'll be there when they say. Just like that, if you mail your bag you won't have to lug it around Tokyo. It's a big life-saver, very reliable and incredibly reasonable. You will need to book your international flights to/from Japan. You need to arrive in time to be at the meeting point at Morioka Station by 6:45pm on day-one of your trip. If you're planning on arriving on the day your trip starts, note that NRT airport is 2 hours from Tokyo Station. If you can't make it to Morioka Station in time, you'll need to arrive the previous day and spend a night in Tokyo. At the end of the tour, we'll arrange for you to be back at Tokyo's Narita Airport by 3:30pm so you shouldn't get a flight out earlier than 5:30pm. Since the return trip is via rail, the chances of a significant delay are very small. If you intend to go back to Tokyo at the end of the tour, you can expect to be arriving in Tokyo Station by 2pm. If you're planning on staying in Tokyo for a few days, note that you can mail your ski bag straight to NRT airport for about ¥2,000 (approx US$18)--that way you won't have to lug it around while you sight-see or travel around other regions. Trying to figure out what trains to take? Use this route planner here. A heavy duty Ski bag/ Snowboard bag with wheels. Unless you add 2 days to your trip at the beginning and end to allow time for mailing your big bags, you'll be hauling your ski bags on the trains once or twice. To be able to move through train stations with minimum hassle, ski bags with wheels are highly recommended. A day pack. Very useful to bring a change of clothes when we stop by an Onsen Hot Springs on our way back from a day of skiing. ​Looking at the What's Included page is a good starting point to get an idea of what you'll need to spend money on. Other than that, the amount of money you spend in Japan largely depends on your preferences. Do you want to eat sushi every day? Are you going for the most expensive sake? Will you be buying lots of souvenirs or electronics? ​Currency exchange window. 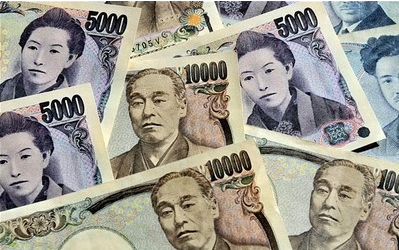 You can exchange your home currency into JPY after arriving in Japan. This is a very simple option as there is no bank to get in the way and decline your currency conversion. The simplicity has a price though because the exchange window doesn't give you the most advantageous rate.